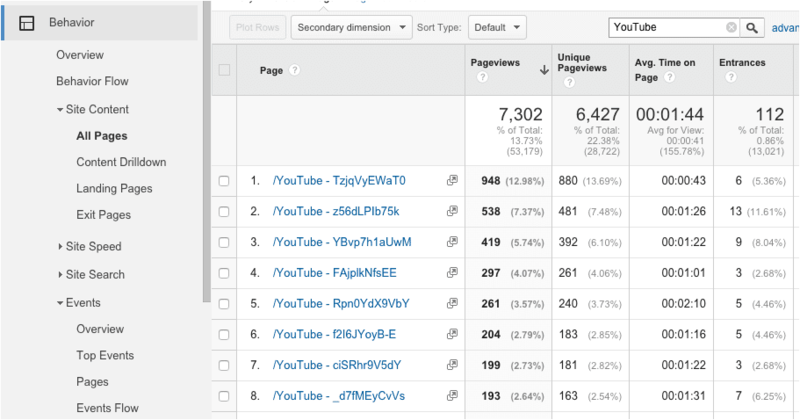 One important factor in the use of Google Analytics for video metrics depends upon how you implement videos. If you use YouTube’s standard embed or iFrame, then video analytics are tracked via your YouTube channel and therefore are not integrated with your other site analytics. However many companies implement a pop-up overlay to ensure that videos are displayed at their best size for viewing quality and clarity. This takes a little extra work, but it’s worth it. And with Google Analytics tracking our videos, we don’t give anything up in terms of important metrics. Video Views – If you launch your video into a pop-up overlay, you can capture that event and record the exact time and date of that view in Analytics. You can also record a view for that video. You’ll want to monitor this metric when conducting campaigns designed to drive traffic to your site. A spike or decline in views can also alert you to activity trends on your social media channels. In Analytics, go to Behavior, Site Content, All Pages and search for your unique video identifier (we use “YouTube”), and then sort by Pageviews to see your most popular videos over any time frame. If you embed your video into your page, then you’ll have to get all of your analytics from YouTube itself, and the results won’t be integrated into your Analytics account. We implement our videos in an overlay, so we can track usage alongside page views. Most Popular Videos – If you are tracking Video Views, you can get an aggregate report of all the videos across your site, with the most popular first. This is especially helpful when you have a lot of videos throughout your site. With a little bit of up-front work, you can track key metrics about your videos, prospects and clients across your site. This pays off in the long run by providing you with detailed information about the effectiveness of your video marketing programs.